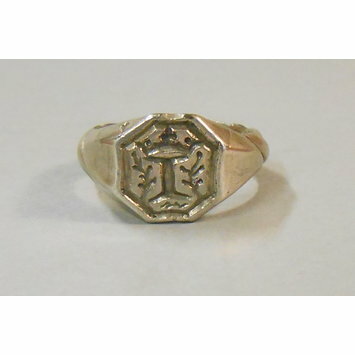 Signet rings, engraved with a coat of arms, owner's initial or the mark used by a merchant to identify his goods are one of the most common types of surviving medieval and Renaissance rings. The engraved bezel of the ring was pressed into sealing wax and this was then fixed onto a letter or deed. The bezel of this ring is engraved with a crowned letter 'I', probably the initial of the ring's owner.